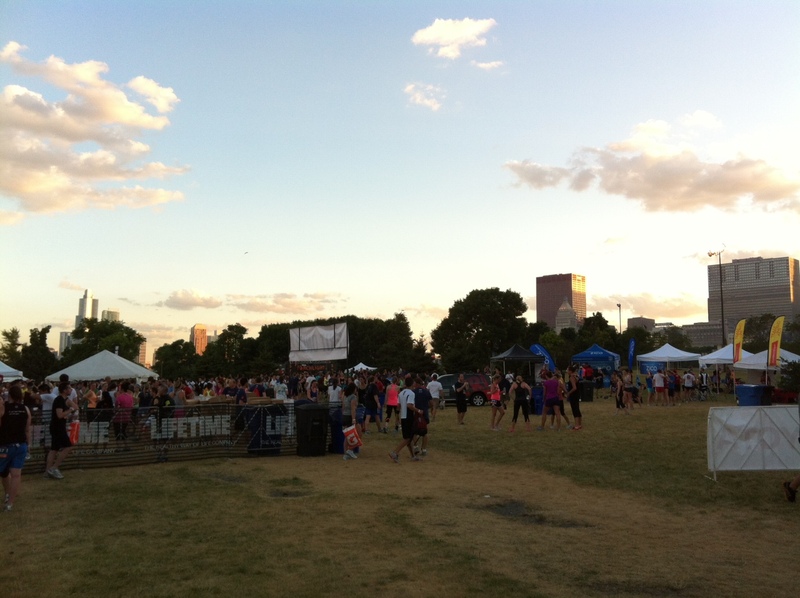 Breakdown: Open courses are not ideal and not tracking official times is a turnoff, but with nearly 1, 000 Groupons sold, Life Time Fitness had an impressive 1,300 or so people out for this inaugural Torchlight Run 5K that began and ended on a grassy knoll in front of the Columbia Yacht Club. The party atmosphere (two free beers per runner), relatively low cost and stylish shirt should create good word of mouth, though not necessarily in running circles. This one is “really about the party afterwards” as the race announcer declared just before blowing the horn to kick things off. I talked to several participants (including a few first-timers) who were drawn in by the Groupon; maybe this will inspire other organizations to up their numbers via similar discounts, but cutting timing chips to keep costs down can also cut out the chunk of the running community that cares about their “official” results. Course: Out and back open course along the Lakefront Path (read: watch out for non-racers), starting and finishing on the grass in front of Columbia Yacht Club. Nice incorporation of hills and bridges made for a challenging course. Mile markers seemed off—I’m guessing the second mile was too long. Organization (gear check, etc. ): Limiting packet pick-up to race-day only led to long lines before the race, but an unorthodox system of not assigning bib numbers till pick-up time alleviated this issue and sped registrants through the system, getting the race started on time. No official timing chips is a bummer but feeds into the “fun run” concept along with the post-race beer and DJ. Gear check was numbered and bags were provided for those without their own. Lots of recycle bins. Goodie Bag (includes shirt): Stylish dark blue soft cotton t-shirt and two free post-race beers. No paper wasted on deals and advertisements. For those with a Groupon this race was a steal.